Ramona Ausubel pushes for her characters to be more, feel more, experience more. There are writers who show us the world as it is and writers who show us the world as it is not, dropping surreal events and inflections into otherwise believable settings. The latter group often ends up showing us more about “reality” than the former. This is a large and well-established group: Lydia Davis. Miranda July. Steven Millhauser. Kevin Brockmeier. Chris Adrian. And many others. 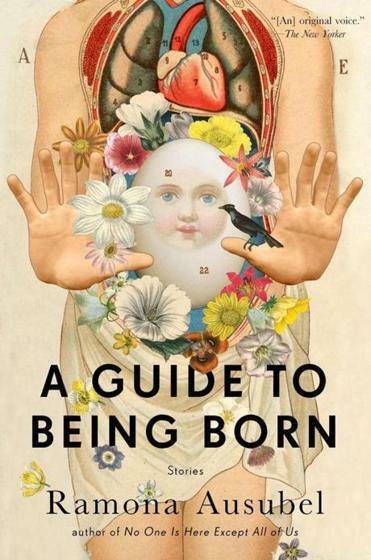 Ramona Ausubel belongs to this group; many of the stories in her new collection, “A Guide to Being Born,” contain elements of fantasy juxtaposed against starkly realistic elements, and the fantastic casts the realistic into relief. But what distinguishes Ausubel from the other writers practicing this near-genre is her expansiveness. Though that quality has its hazards, it hits its mark very securely here, more often than not in an epiphanic way. The stages of human life, death, or grieving provide the subject for many of the stories here, most frequently birth or childhood, as the title suggests — which means, for this book, the act of being a parent. Ausubel torques these stories in unexpected ways, though, and her parent figures gain our sympathy by never being entirely able to cope with these twists. In “Poppyseed,” an 8-year-old developmentally challenged girl grows breasts and pubic hair, to the consternation of her parents — her body achieves the growth her brain cannot. When the girl’s breast buds are removed to stop that part of her physical development, her parents find a way to cope with the situation that is absurd, and in its own way violent, but believable in and of itself. In “Atria,” a pregnant woman becomes convinced that she is giving birth to various animals. While her extensive imaginings ultimately engulf her experience of birth, making it so she sees a baby seal when gazing directly at her human baby, her prenatal hallucinations reveal a great deal about universal all-too-human fears about what it is, exactly, that takes place during human conception and pregnancy. To call these stories ambitious is wholly accurate; Ausubel is constantly pushing for her characters to be more, to feel more, to experience more. In this rush, though, some things are overlooked. For instance, her female characters are often invested with the most personality, the most feeling, while her male characters are often ciphers. The soon-to-be father in “Chest of Drawers,” as if in an unintentionally ironic gesture, has drawers growing out of his chest, as if to suggest how empty he is. Also, the stories are occasionally end-loaded, as if each story’s bulk were an excuse to get to the conclusion, resulting in a mix of workaday sentences with more poetic ones. These slipups don’t change the final effect of the book, though, which makes you feel as if you have emerged from a concert of atonal music, every object in the world momentarily transformed by Ausubel’s gloriously eccentric vision.